Featuring superior turning capabilities with exceptional traction, the new 21 horsepower all wheel drive Kubota GR2100 “Glide-steer” ride-on mower is the latest product to join Kubota’s extensive range of mowing equipment. Fitted with a 1.2m (48 inch) side discharge mower deck, the GR2100 is small enough to manoeuvre in confined spaces yet powerful enough to efficiently mow larger areas. The simple and effective all wheel drive glide-steer drive system elevates the GR2100 to a level far higher than conventional ride on mowers. Not only is the all wheel drive advantageous for mowing in slippery or on undulating ground conditions, it also significantly reduces the turning radius without scuffing. This is achieved by disengaging the drive to the inner rear wheel when making a turn. By installing a wet mechanical clutch on each rear wheels’ drive axle, turning the front wheels to a pre set angle will disengage drive to the appropriate rear wheel. Unlike conventional four wheel drive mowers, the GR2100 does not have to “fight” against the forward drive of the inner rear wheel thereby achieving an exceptionally tight turn. Operating the GR2100 is easy. Kubota engineers have designed the entire operating platform to be comfortable and practical. There is plenty legroom which can be further improved by adjusting the high back suspension seat to the rear position for tall operators. All controls and levers are within reach and the hydraulic deck lift takes the strain out of raising the mower deck. Mowing height can be adjusted incrementally from the seated position and the hydrostatic power steering reduces steering effort to the point where even after long hours of mowing operator fatigue is minimal. The hydrostatic transmission provides the GR2100 with an incredibly user friendly method of controlling both speed and direction. Operators simply push down on the foot pedal to go forward or reverse, with the degree of applied pressure controlling ground speed. For mowing large areas a cruise control can be set enabling operators to “enjoy the ride”. 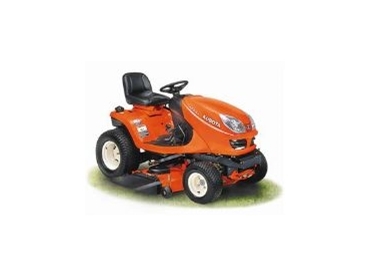 Powered by a liquid cooled 3 cylinder new generation Kubota diesel engine, the GR2100 runs quiet and smooth delivering plenty of horsepower to the three blade mower deck even in testing mowing conditions. A durable wet PTO clutch ensures power to the mower deck is transmitted smoothly. The entire engine compartment is accessible by lifting the one-piece hood making maintenance and daily checks quick and easy. For extra convenience the large capacity fuel tank has a dash mounted fuel level indicator. An hour meter is also installed so servicing intervals can be actioned on a timely basis. With all the advantages the GR2100 has to offer, it’s popularity among high end domestic users and semi commercial operators is virtually assured – especially considering the value for money retail price tag of only $13,995 excluding GST.